Sound pollution is a serious problem for highly populated cities. It effects health and reduce quality of life. Before we deploy smart cities around the world, this issue needs to be addressed. The Solution:why Sony Spresense development board ? 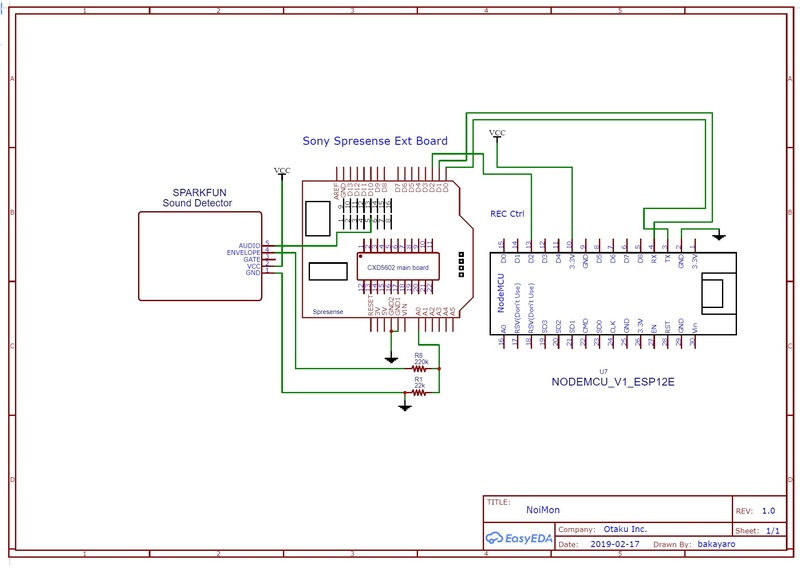 The noise pollution sensing system will be built around Sony Spresense development board. Since, this board has built in GPS and Audio features, it can report location and noise level data. For a moving solution. It can be tied to low noise moving vehicles, which will collect noise level, location and time info, store to SD card and have cellular connectivity. For fixed location solutions it may be mounted on traffic lights/street lights and have wifi connectivity. Multiple solutions will be installed through out the city to create a noise level map data. Over time complete map of noise level in dB can be generated. In this project, a fixed solution will be built which is wifi connected. As for the IoT part, NodeMCU will get the data from the Sony Spresense development board. For data visualization, a custom app built on Blynk will show the information on Google Maps and tabulate historical data fetching from on board SD card. Custom Android App is developed with Blynk IoT. An Auth Token was received from Blynk Server by email for using in code. This sensor module from spark fun provides audio output for recording and audio envelop (amplitude) output for audio level. If calibrated with standard dB scale, it can provide noise level data. NodeMCU acts as the bridge for connectivity, since the Sony Spresense board does not have any IoT connectivity. It received noise level data and GPS location through serial from the Spresense board and send those data to Blynk Server. The Blynk server sends those data back to user's phone running Blynk App. This code is flashed on the Sony Spresense board. It performs GPS scanning, sends GPS data+noise data to Nodemcu through Serial. The following code is flashed on the nodemcu. It runs Blynk for connectivity to Blynk App through Blynk Cloud. It also fetches GPS and Noise Data from the Sony Spresencse board through Serial. Since, Sony Smersense board support up to 8 microphones, it's possible to separately measure directional sound in x, y, z axis. That is for another day ! Remote recording is a feature to enable recording over the internet. Just by pushing the Record Button. Such feature can be used for audio surveillance. The project is a quick demonstration. The noise sensor is not calibrated with standard equipment. For full fledged commercial solution to make a true noise pollution map, multiple sensor hubs are required to be install around the city. More work is needed in design and optimization of both hardware/software end for power, data and cost saving.